It’s fairly easy and very yummy and it’s definitely worth trying. Since I don’t know the origin of my version anymore, you can find a fairly original version of this dish here. 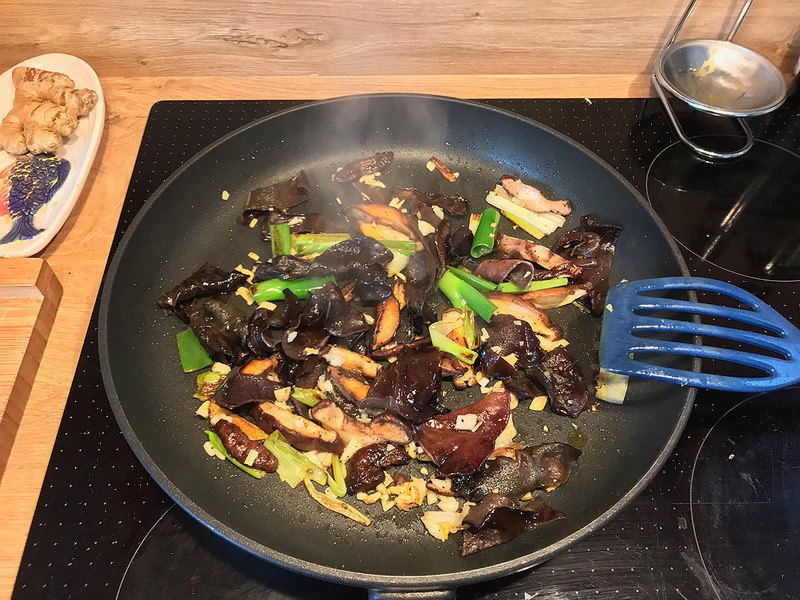 Soak the dried wood-ear mushrooms in boiling water for 15 minutes to soften, then drain and cut into broad strips. Beat two eggs, slice the spring onions into large pieces, mince garlic and ginger and set everything aside. Cut the meat into thin strips. In a pan on high heat, stir-fry ginger and garlic, add leek and mushrooms and let cook briefly. Take out of the pan and set aside. Finally add the eggs to the pan, let cook and try to create some chunks of egg. Once done add all the other ingredients back to the pan and add the seasoning sauce. Let cook a little to reduce the sauce. Dish up and serve.